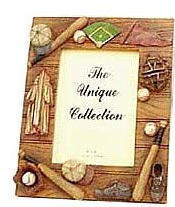 Size (inches): 8.27" X 6.69" X 1.38"
Capture those sporting moments in a budding athlete's little career with this special Rustic Baseball Photoframe. Beautifully adorned with objects arranged in a baseball theme, this frame will undoubtedly preserve those very special times in a child's life. More Photographs - Rustic Baseball Photoframe - 4x6"
End of More Photographs - Rustic Baseball Photoframe - 4x6"